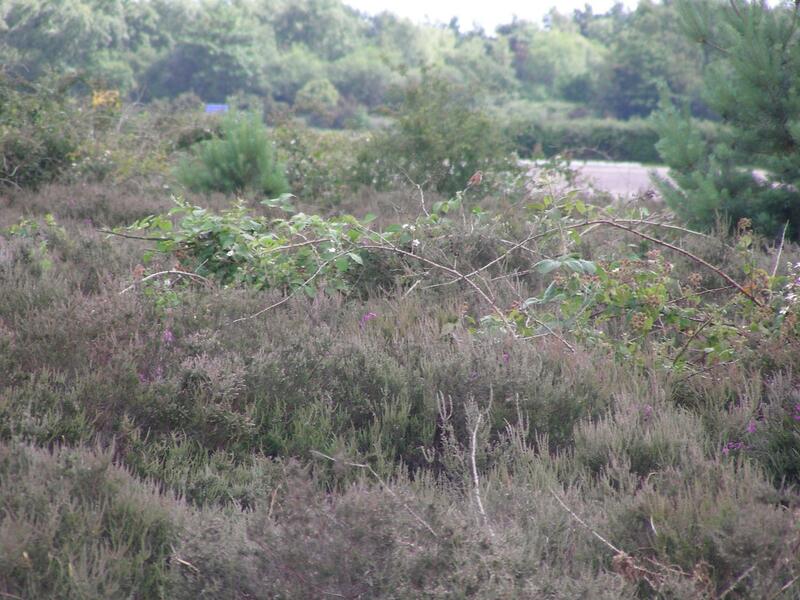 Can “Rush” be filmed, access retained AND the wildlife protected? Last night’s post on the proposed filming of pit lane and grandstand sequences of the Ron Howard film “Rush” seems to be causing a big stir. For some there are positive outcomes to look for: the fascination of F1 or big name films; the possible stimulus to the local economy. For many (like me) it’s more about our concerns: the protection of wildlife during the spring and summer breeding seasons; the access issues for local residents and groups who use the site regularly, often to engage and support local young people. The most positive outcome for everyone would of course be for filming to take place without denying access to this public area and whilst taking care to not overly disturb important and in some cases, protected, wildlife. So here’s what various responses to my concerned emails have so far told me. Please feel free to use the information to carefully validate your own responses. The date between the closing of the consultation period on the application (11th January 2012) and the proposed start of work building the set (9th January 2012) is impossibly tight! It has also allowed very little time for interested parties to make their comments, especially given the current holiday season when many organisations like the RSPB have their offices closed until 3rd January 2012. This may not be deliberate, but it doesn’t help the local community to feel it has been positively engaged with the project. The response of the Scout Group leaders who run the Scout Lodge adjacent to the site, and use the site to teach environmental use and responsibility to youngsters, would also appear to show that no attempt has been made to consult with those that will obviously be affected by the application. At least one local Councillor believes that the land concerned is Common Land. Apparently the film set could therefore need approval of the Secretary of State, a process that is presumably long and expensive. The Land Registry could confirm this, but I can’t afford the expense and the application doesn’t make it clear as far as I can see. 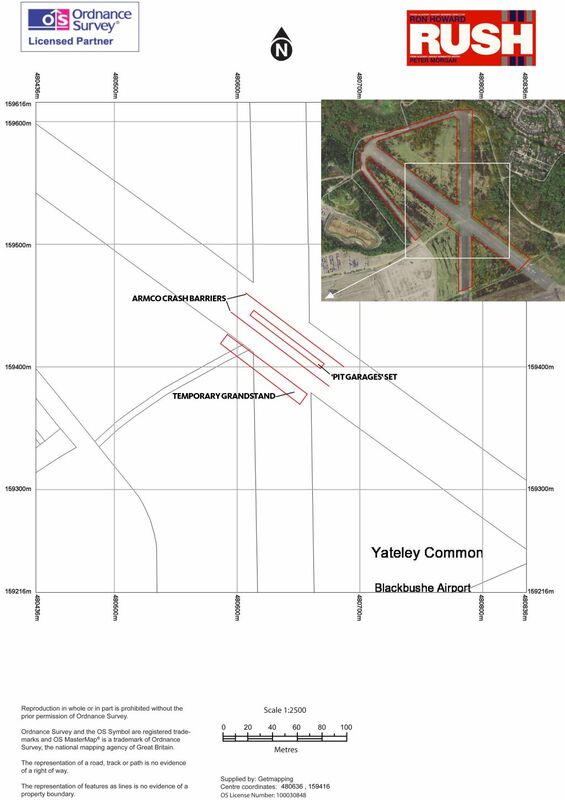 If these disused areas of Blackbushe Airport that seem to make up part of Yateley Common Country Park were covered by the Thames Basin Heaths Special Protection Area then members of Hampshire Ornithological Society inform me that filming would automatically be impossible during the breeding season for Schedule 1 birds (March – May). However the airfield was excluded when the SPA was designated. the landowner/film crew would be breaking the law if it were to be proved that there work was disturbing the locality of or adjacent to such nest sites. 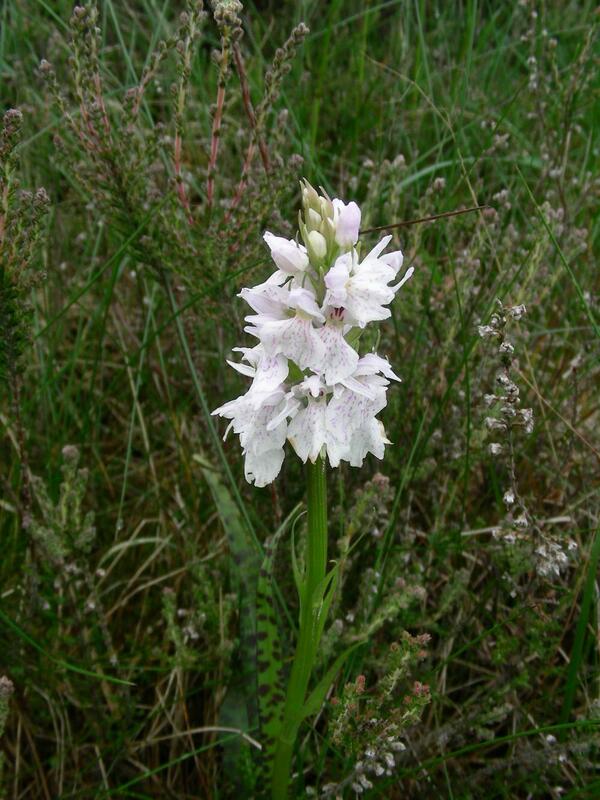 In addition to these and other rare, but less protected bird species, who nest in the same areas and into the scrub in the north and east of the site, there are also wildflowers like the Common Spotted Orchid in the same heathland areas between the runways, and Glow-Worms that display and mate in the cracks in the old tarmac that the application wishes to replace. It is illegal to uproot any such wildflower (by whatever means) but the Glow-Worm which I had assumed was a rare insect has no more protection under the law than a woodlouse! If filming was completed for June they would not be directly affected, except if their favoured spots were covered by new tarmac. some other solution other than new tarmac that would return the area to its existing state after the production. Formula 1 film set on Blackbushe during rare bird breeding season? On Dec 23rd we noticed two signs whilst coming away from a walk on the disused part of Blackbushe Airport. They looked like those shown here, but we had no means of recording the details. They had not been visible on 21st December during our previous walk in the area. The following day Christmas Eve, both had obviously been torn down. On Boxing Day we finally got to take these photographs when the signs reappeared in slightly different places, as specified with the images. Investigation showed that the application referred to in the paper marked in pink is here and is for a temporary (5 month) film set to be placed across an area forming the centre crossroads of the disused area of the airfield at Blackbushe. The full supporting statement 11_02695_FUL-SUPPORTING_STATEMENT-555171 (which I have downloaded from the planning application) explains that the film will be about the 1976 struggle between Niki Lauda and James Hunt for the F1 Championship. The references on the second sign, which shows different dates, don’t seem to lead anywhere at all. 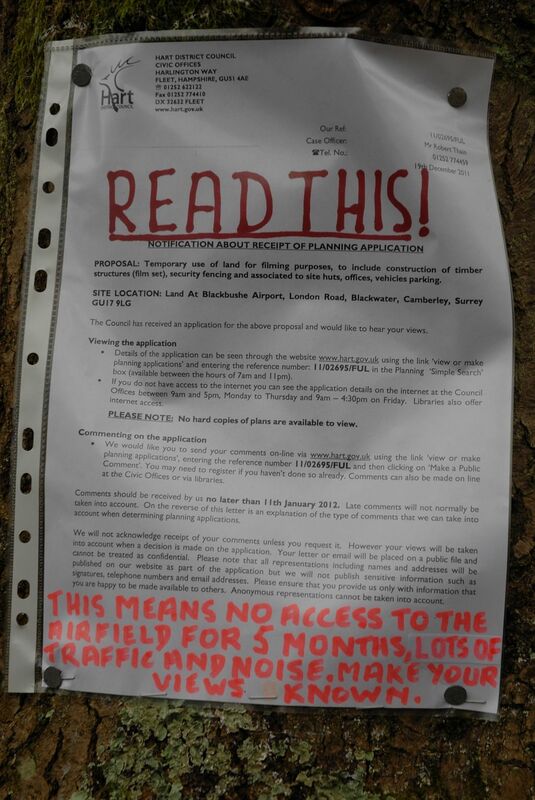 Neither sign has been placed anywhere on the actual site to which the application relates, and many people could be walking across the site being none the wiser to the proposed application. We could be quite excited to have a film crew working in the area, possibly bringing additional work and business to the area. This however assumes that the film company are true to their word to “bring economic investment to the local area” and not bring in their own trusted subcontractors. We could talk about the restrictions this film set (construction of which is proposed to start on Monday 9th January 2012!) would place on our normal routine of dog walking, and those of probably hundreds of others who live local and enjoy walking (with or without dogs) or riding across the disused airfield every week. But, darned inconvenient as this would be, this is not our most major concern. What is a major concern is that we have witnessed in the last year (and in previous years), the adults and young of at least one Schedule 1 – Part 1 bird species within the area covered by the application, and during the breeding season. The presence of both adults and juveniles would suggest that within, or immediately adjacent to the area, are breeding sites for this bird. We have also witnessed the adults and young of one other relatively rare bird, a summer migrant, within the planned area of the film set and its immediate locality. The site specified lies within a wildlife corridor between Yateley Common Country Park and Castle Bottom Nature Reserve (a Special Protection Area for bird populations). Since the film set construction and use is proposed to run from January until the end of May 2012 this will cut across the breeding season of all birds, including those protected by the law relating the Schedule 1 species. 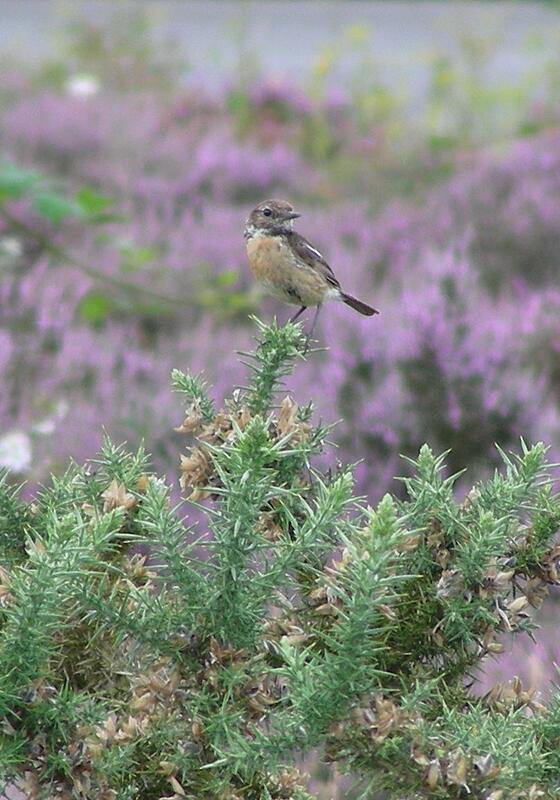 The female Stonechat pictured is just one of the other (less protected) species which I would expect to have the breeding sites disturbed by this film set. We have also seen non-bird species that are protected under the 1981 Wildlife and Countryside Act, like the Common Lizard. Once we have checked one or two further facts relating to the wildlife of the area covered by this application for filming, we will be making our formal objection to the planning application. After making some enquiries we have learnt that Eversley Parish Council are meeting to discuss this at their planning meeting on 4th January 2012, and Yateley Town Council representatives are meeting the applicants in early January 2012. Natural England‘s offices are shut until 3rd January 2012. 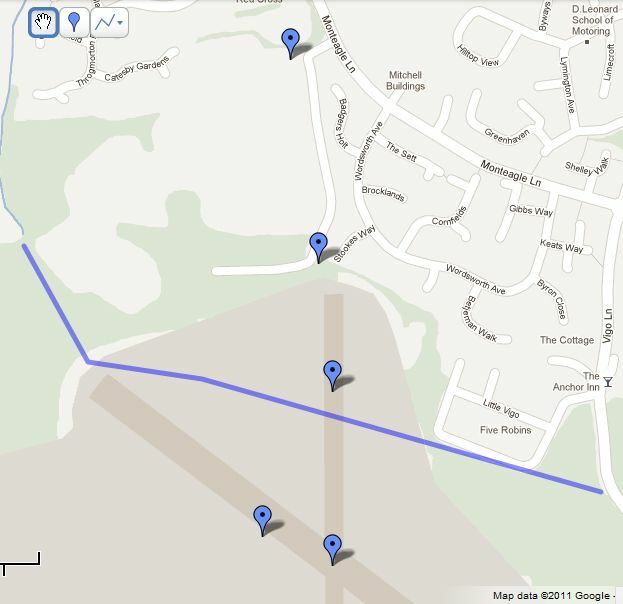 The map shown here downloaded from the planning application links to this map from Googlemaps. 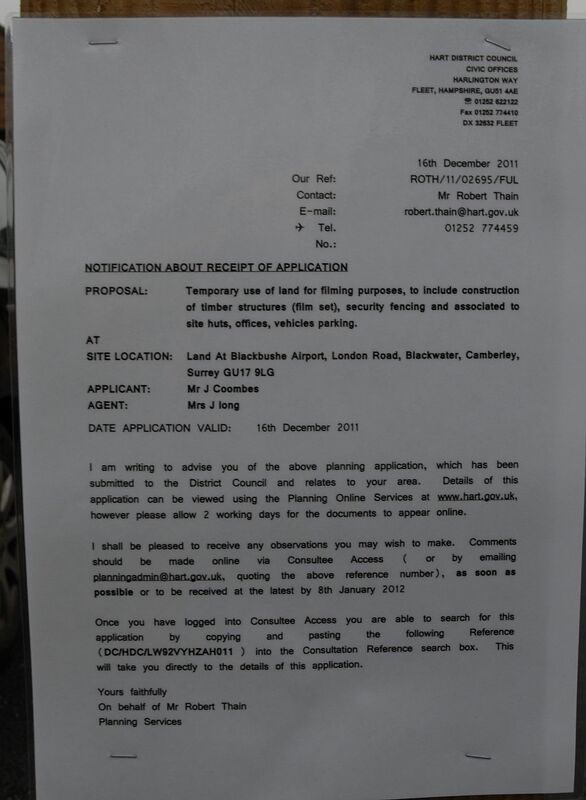 If you visit the disused part of Blackbushe Airport regularly, we would invite you to consider your own views, and make them known here by 11th January 2012 (the date on the planning notice – even though this is later than the proposed start date of construction of the film set!) Please read the detail of all the documents carefully when doing so, and relate your comments directly to them so that the authorities can see that your views are well informed. Further news and thoughts on this story are in my next post. 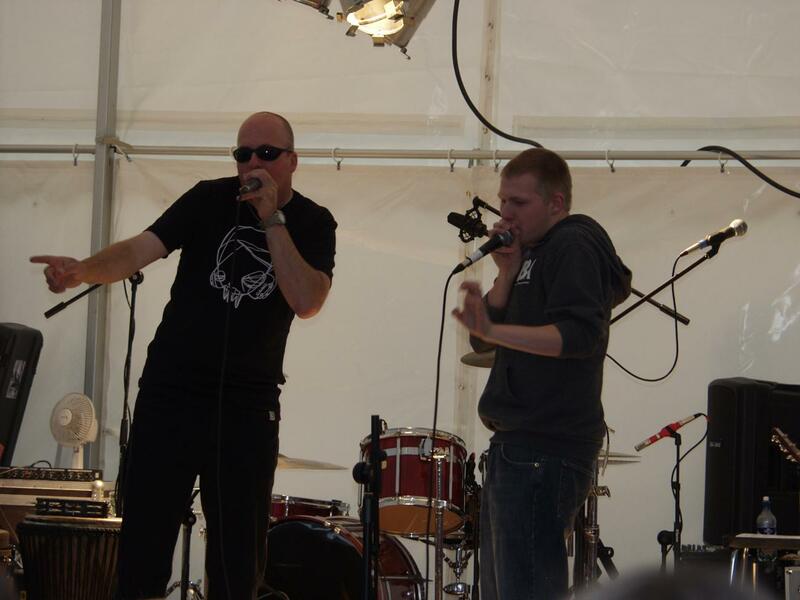 OK I’ve led a sheltered life: Until 16th June 2007 I had never heard of “beatboxing”. That was the day some entrepreneurial types in our parish put on some entertainment on the village green, which included the Psalm Drummers and two guys called Hobbit and Gav (pictured left on that occasion). Gav was a curate not too far afield, and known to various of our exceedingly talented local musicians. What the two of them produced completely blew my mind, and I’ve been a fascinated watcher of beatboxing ever since. It was great that the musical genre even made this years Proms courtesy of Beardyman. This morning, Revd Gavin Tyte even got the interview slot on Chris Evans Radio 2 Breakfast Show, at the end of which he gave a rendition of The Annunciation which is a simpler rap, but none the less powerful for that. Listen to today’s broadcast on the iPlayer from about 2:07:30 minutes in. So congratulations to Gavin, and thanks for sharing the Christmas message in a way that will be fresh to many. And well done to the Archbishop of Canterbury for the plug he obviously gave Revd Tyte on Friday’s Chris Evan’s show! FESTIVE RESPECT! Advent is a time of preparation. Preparation to understand afresh what it means to us now that Christ came into the world as a tiny helpless baby. Preparation as a minister, to make others welcome at Christ’s Nativity as they respond to their own need and desire to make the story come alive for themselves, or for others. For me at a personal level this year, Advent will roll through winter into Lent, and it looks like all my ‘preparation’ will last till Easter! It is proving to be a time when I have much to think about for events happening later next year, and when I am feeling more than a little ‘helpless’ myself. God is in control, of that I am certain. He desires nothing harmful to us, though plenty that is challenging. Yet very recently as a family we have sensed a spiritual battle that has seen (among other things) me suffering ‘mystery rash’, and our bank account being used fraudulently. I have also struggled to engage with the theme of Advent and preparations (both spiritual and more practical) for celebrating Christmas. These things have proved a distraction from both the ministry in which I am involved in the parish, and my focus on God’s will. The devil it seems, doesn’t like it when we give God full control of our lives; yet I must remember I am not helpless against his works, as we have God protecting us, that we might serve him faithfully. At my spiritual directors suggestion, I have re-written parts of Psalm 91 to pray with my family, over us. I actually found the process of re-writing it very helpful, as I journeyed emotionally into a place of shelter carrying with me all that I ‘hold’ that is being entrusted to me by God. Which is much more in keeping with the Advent image of Mary, who trusted and glorified the Lord, despite all that God required of her, and all the tribulations that were sent in the wake of her obedience. 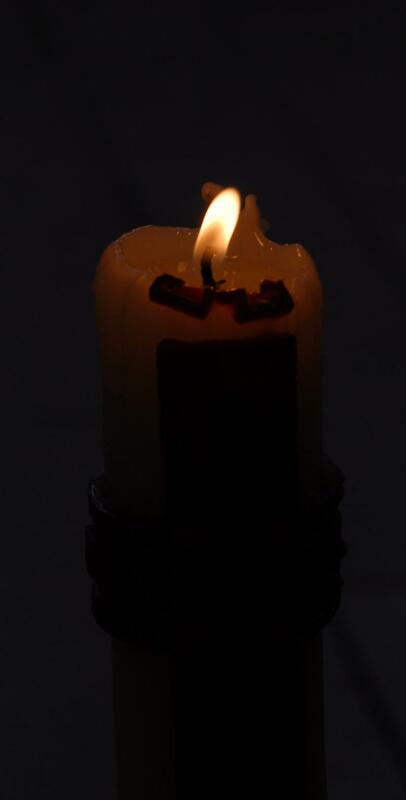 It also brings with it a sense of light, in what could otherwise be emotional and spiritual darkness. Perhaps I’m not so out of touch with Advent after all! and rest in the shadow of the Almighty. our God, in whom we trust. from the fowler’s snare and from the deadly pestilence. and no disaster will come near our home. so that our feet will not strike against a stone. from the works of the devil. We will call on his name, and he will answer us. that which we seek to do in his name. And he will show us his salvation.